This book is set in the year 1954. I was around then. I was 12, and I was reading EC Comics. Lots of others, too, but some of the stories I saw in EC Comics have stuck with me to this very day. I can remember the panels as plainly as if I'd seen them last week. They were potent stuff, for sure. I read the newspapers in those days, too, mostly the sports pages (not much has changed with me in the last 60 years), but I was vaguely aware of the activities of Dr. Fredrick Wertham, who wrote a book with the same title as this one, and of the congressional hearings on comic books, in which America learned that comic books (especially EC Comics) were to blame for juvenile delinquency and many other assorted ills. I was even more aware of the results of this hearing a bit later, when the "Approved by the Comics Code" seal started to appear on the comics (we never called them comics, by the way; they were "funny books" even when they weren't funny). Not long after that, I lost interest in comics. The guts had gone out of them. I moved on to the SF digests and never looked back. I was vaguely aware of the Marvel revolution in the '60s, but it was too late for me by then. My interest was finally revived the the Underground Comix in the late '60s and early '70s, but I never read comics again the way I once had. One comic I did keep reading was Mad. Gaines quickly turned it from a comic book into a black-and-white "magazine" so he didn't have to deal with the Comics Code stuff, and somehow, although my mother tossed all my funny books, the old issues of Mad survived. I don't have issue #1, but I do have a nice little run starting with #2. I bought the paperback collections, too, and I still have the first three or four of those. 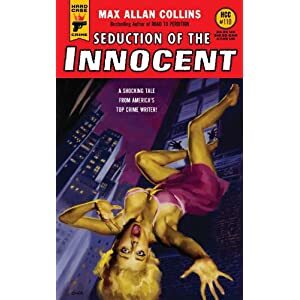 Which is all by way of introduction to this thoroughly entertaining novel by Max Allan Collins, in which Dr. Werner Fredrick appears before a congressional committee made up of the same people who questioned Wertham. So does Bob Price, whose testimony is remarkably similar to the words spoken by William Gaines when he testified before the committee in '54. Not long afterward, Fredrick is murdered (this didn't happen to Wertham). Jack Starr gets involved because he and Maggie Starr (his stepmother) deal with comic strips through their syndication company. There are plenty of suspects, including Price. There's a comic book artist, a comics reader, a publisher, and some other social critics. All have their reasons to want Fredrick out of the way. You can play the guessing game about which real people the characters are based on, or you can go to the "Tip of the Fedora" at the end of the book, where Collins spells it out. I think many of you won't need to do that. And if you don't think this book is relevant now, you haven't been following the news lately. Besides the dandy storytelling here, there's the Glen Orbik cover, which replicates one of the more famous EC covers, plus a lot of illustrations by Terry Beatty in the good old EC style. Lots of bang for your buck here. The book comes out in February. Be on the lookout; you don't want to miss it. And Wertham, if anything, hated CRIME DOES NOT PAY even more than the EC horror and crime titles. I'll need this one. I started reading EC's when I was in my twenties and they were collectibles. I was more drawn to the Shock, War, and Suspense titles than the S-F, but I loved them all. In my first fanzine, Comickazi, I wrote a fake interview with Wertham (Dr. Werthless), which we mailed to him. He wrote back, too. This was in 1969. Lee Dorman, R. I. P.
Jimmy McCracklin, R. I. P.
Larry L. King, R. I. P.
Assuming You're Still Here to Read This . . . Speaking of the Worst Movies of All Time . . .
Jessie 'Jet Set' Hudson, R. I. P.